Symbols: Put a book, a pen, a candle, a colorful cloth in front of you. Let us each speak our name and say where we are geographically. 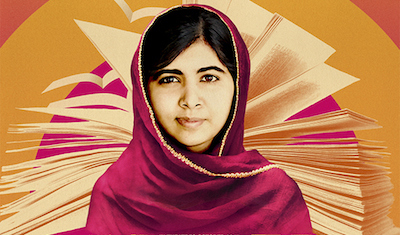 Call to Gather: Why Tell the Story of Malala in July? From a speech given to the UN Youth Assembly, just nine months after her attempted assassination. Malala Yousafzai was born on July 12, 1997, in Mingora, Pakistan. Happy Birthday, Malala! At the age of 11, she became a Pakistani activist for female education, which resulted in the Taliban issuing a death threat against her. When she was traveling home from school on October 9, 2012, a Taliban gunman shot her in the face for her views on female education. She narrowly survived the ordeal and received intensive care in England. Malala is the youngest recipient of the Nobel Peace Prize that she received in 2014 at age 17. In her first book I am Malala: The Girl Who Stood Up for Education and Was Shot by the Taliban, in collaboration with British journalist Christina Lamb, she demands worldwide access to education. Malala survived a horrendous act of violence and continues to advocate for education and peace. Tonight we also take the chance to think about how we can bring her unbroken resilience back home to the United States, as we struggle to fight for equality in a country made bloody by what seems like daily shootings. May we take a moment to remember those killed in Baton Rouge, St. Paul, and Dallas last week: Alton Sterling, Philando Castile, Brent Thompson, Patrick Zamarripa, Michael Krol, Lorne Ahrens, and Michael Smith. We contemplate what Malala’s message of strength can teach us. Let’s take a moment of silence together. Let us honor Malala by listening to her words of commitment to international education for women and children. May they inspire us to go out and make a change in the world today. From a speech at Harvard University in September 2013. “This is the sound of one voice…. “Let us make our future now, and let us make our dreams tomorrow’s reality.” From a speech at Harvard University in September 2013. From the Nobel Lecture in Oslo, December 10 2014. We remember that Malala was one of three girls shot that day by the Taliban. From Malala Yousafzai, speech to the United Nations, 12th July 2013. Use any of these questions to begin your personal reflection. What about Malala’s life has touched you? Who encouraged and supported your own education? How do you keep doing justice in the face of discouragement? We pray for the lives lost in Baton Rouge, St. Paul, and Dallas. May a quality education help enlighten people to use intellect and compassion to end conflict, instead of brute force. Response: May peace be with us all. We pray for the end of abuse, of any and all kinds, against women and girls. Like Malala, may they be inspired to rise out of silence, find a voice, and help raise each other out of the darkness of violence. We pray for all girls worldwide who are denied education or experience a lesser form of education, just because of their gender. May the world realize that in order for humanity to reach its full potential, we must empower both men and women. We pray for the end of the seemingly universal stream of violence both in the United States and abroad, and reflect on how an upbringing in this world marred by hate affects a child’s development and actualization. We pray for the lives and the well-being of peace, education, and human rights activists. May they take care of themselves emotionally and physically and continue to do the important and blessed work that they do. May they keep fighting even when they are tired, keep walking even when they are blocked, keep speaking even when they are silenced. May they inspire us to continue with our own fights for justice. We will now send children’s book donated by the Hunt-Neu family and the WATER office to Saint Camillus, a local Catholic parish engaged in community work. May we all commit to contributing to the education of youth. Taking a book to a shelter. Reading a book with a child. Supporting educational centers important for girls such as libraries and community centers. Let us greet one another with peace and send peace to the world.